Researcher ANSELM PI RAMBLA, an expert in ancient symbology and specialist in oriental and pre-Columbian cultures, has been able to decipher the mysterious sign of the Peruvian coast, located in the bay of Paracas, about 300 km south of Lima, called by the natives of place the Candelabro of Paracas. 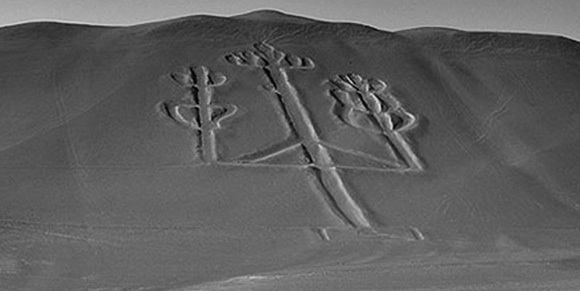 After several years of a patient investigation, Pi Rambla, has unraveled the meaning of the famous geoglyph, also called the Trident of Paracas, getting what so many specialists have tried for decades. Many hypotheses have been proposed for many years about its interpretation, but for the moment none have been shown or accepted by official archeology. Since the first works carried out in Paracas by the great Peruvian archaeologist Julio C. Tello to date, neither rigorous investigations nor state-of-the-art techniques have been carried out to decipher and interpret their true meaning, motive and purpose. My first contact and analysis of the Candelabro was in 1982 with the creator and promoter of the Paracas Reserve, Dr. Felipe Benavides, President of the World Wildlife Fund of Peru (WWF - Prodena). In that then the investigations carried out were not enough to decipher this important Geoglyph. They had to pass several years in which applying techniques of different disciplines we finally gave with their meaning, interpretation, motive and purpose. I wish to state that there is no doubt that the Paracas Candelabro has been designed, constructed and positioned by precise astronomical and geodesic techniques with a specific and determined purpose, which we will make known to the entire international community supported by our team, composed of specialists in different disciplines (history, archeology, anthropology, archeoastronomy, architecture and SIG). With reference to its design we must point out that it is unique throughout the American continent, there is no other equal, its layout obeys an old concrete symbology and a precise interpretation that refers to one of the greatest mysteries of our Planet Earth hidden in these Peruvian lands. The sandy dune on which it is drawn is 400 meters high and 40 degrees steep, making it visible from the sea at a distance of about 20 km on a clear day. At the moment the soil of its furrows is formed by the very sand of the desert, consolidated due to the wind and the constant humidity of the sea which helps to its protection. This overlapping sand, originally when the Candelabro was built, did not exist. Their original furrows were formed by a natural sedimentation of the zone, a crystalline saline layer of white color yellowish, whose thickness can be of 50 cm. Or more at its base. This crystalline layer is extraordinarily smooth, with maximum undulations of 1cm in many places of its stroke. Thus we discovered that the Geoglyph, thanks to its location and construction, exercised a nautical function, being a real beacon for the sailors of old times, due to the incidence of the solar rays that reflected in that crystalline base, producing great flashes luminosity that varied during the day depending on the inclination of the Sun, which produced a luminous effect that could be seen from a great distance from the sea. 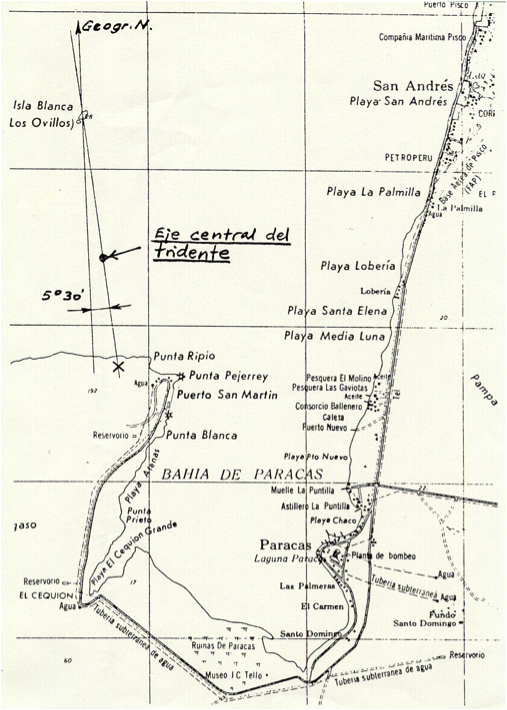 Due to the Tridente / Candelabro's antiquity and the strategic location of the Paracas Bay (Pisco) on these Pacific coasts, although many readers will be surprised at what we say, the place was the gateway to many transpacific trips made in remote times, Fact that we will be able to verify thanks to the existing documentation compiled. The location of the Candelabro as referenced in drawing 1, we have marked it with an X, and according to our archeoastronomical works, we verified that its main axis is oriented 5º 30' West with respect to the North Geographic (NG) . 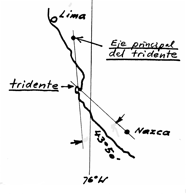 We wish to highlight what many claim that the Candelabro would point to the Nazca Lines (see drawing 2), we note that its orientation of 5º 30' with respect to the Nazca zone differs by about 43º 50' from the line that links Both points. Thus, it is clear and undoubtedly that the Candelabra "NO" points to the famous Nazca Lines. We affirm emphatically that the main axis of the Candelabro points directly to the constellation of the "Southern Cross", formed by the stars Alpha, Beta, Gamma and Delta Crux, constellation and celestial axis of the Southern Hemisphere, the most important symbol of all Amerindian people. This orientation, carried out with high astronomical precision, has a precise purpose and meaning in the cosmovision of its constructors, a purpose that we will soon release with important scientific documentation. the existence of an ORIGINAL CENTER of character SOLAR and POLAR located in a precise place of this mysterious Ancient Mythical Earth. This secret, which for us, its discovery is of unprecedented relevance, connects us with a REALITY unthinkable for our present civilization.